Crunchy golden chips in a mere 90 seconds. This is just one of the advantages of the new Turbo Fries by Aviko, that also boast a lower fat content and a high performance. Introducing Turbo Fries, the record-breaking chips. 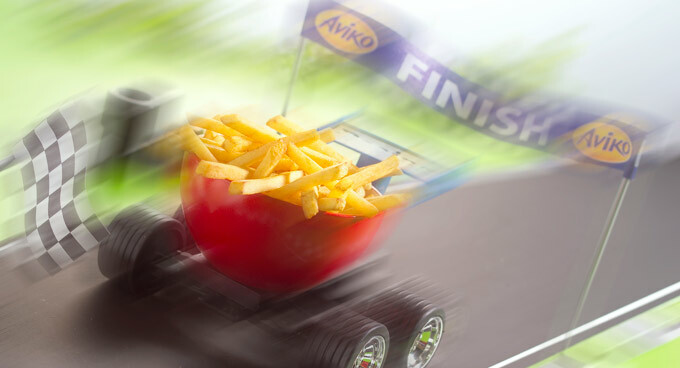 In Aviko´s wide catalogue stands out this product especially designed to satisfy the needs of customers obliged to prepare a large amount of French fries in a short period of time. This is possible by pre-frying the Turbo Fries the minimum additional time to achieve that target time of 90 seconds. Another advantage of the Turbo Fries is its high performance. While standard potatoes retain around 70 per cent of their weight when fried, the Turbo Fries by Aviko preserve 90 per cent of their original weight. Furthermore, given the shorter preparation time, the Turbo Fries potatoes absorb less oil, which in turn means a saving in oil consumption and as a result produce less oily French fries with a delicious flavour. The new product comes in two varieties: 10 mm fries and crinkle cut French fries.